We picked up our Thanksgiving turkeys this morning and finished the last of our grocery shopping—looks like snow’s a-comin’. Now the birds are brining—generously seasoned with kosher salt, tightly wrapped in plastic and safe in the refrigerator for the next two days). We almost bought turkey sandwiches for lunch while we were out, but decided to hold off for our very own best day-after-Thanksgiving sandwiches. 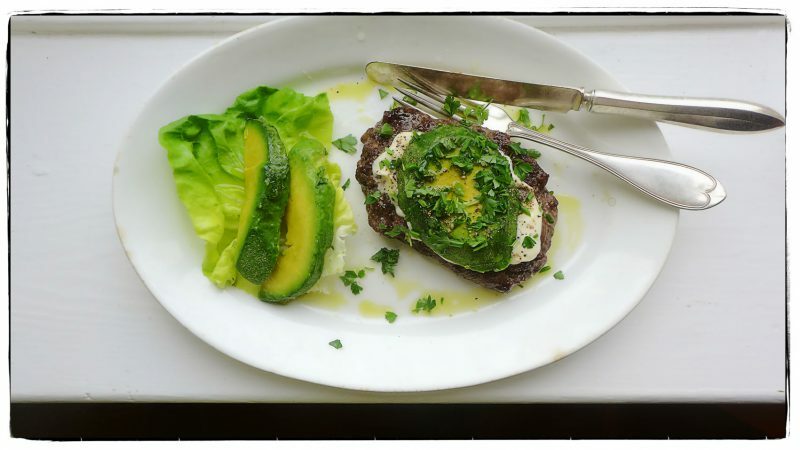 So it is hamburgers with avocados instead. Gobble gobble! Early last week we received a box of unripe Haas avocados, a gift from our southern California friends, the Orr Family, who plucked them right off the trees in their backyard. Wow! There’s almost nothing we love more than these rich, flavorful beauties. We laid the avocados out to ripen and this week they’re ready to eat. (We’re thinking we may just carve them up and serve them for Thanksgiving this year instead of roasting a bird.) 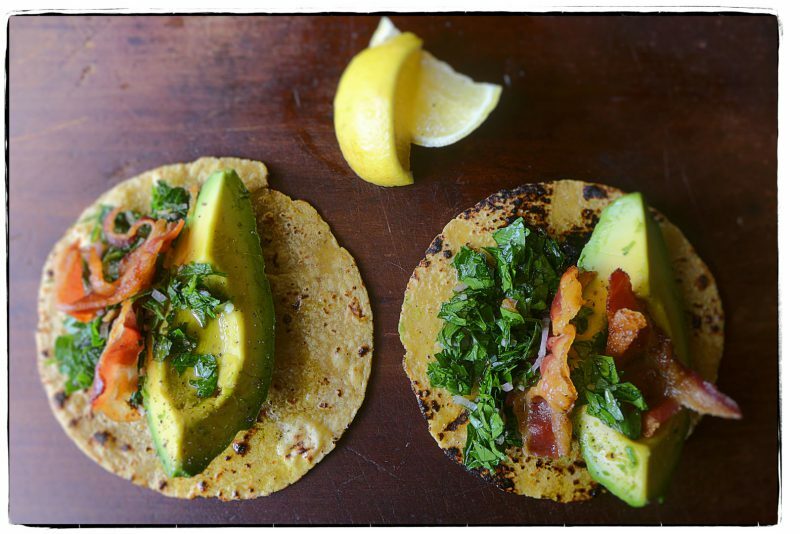 We begin our avocado feasting today with tortillas filled with chopped parsley salad and crisp bacon, seasoned with olive oil, lemon juice, a few chile flakes, and salt and pepper. We are grateful for the generosity of friends. It may come as no surprise that after cooking pots of beans all week long, our fridge is stocked with containers full of delicious leftovers—three varieties of beans to be exact: garbanzos, Christmas limas, and Sangre de Toro. So today, we made, yes, a three-bean salad (a rarity for us) and dressed it up in a garlicky shallot vinaigrette. 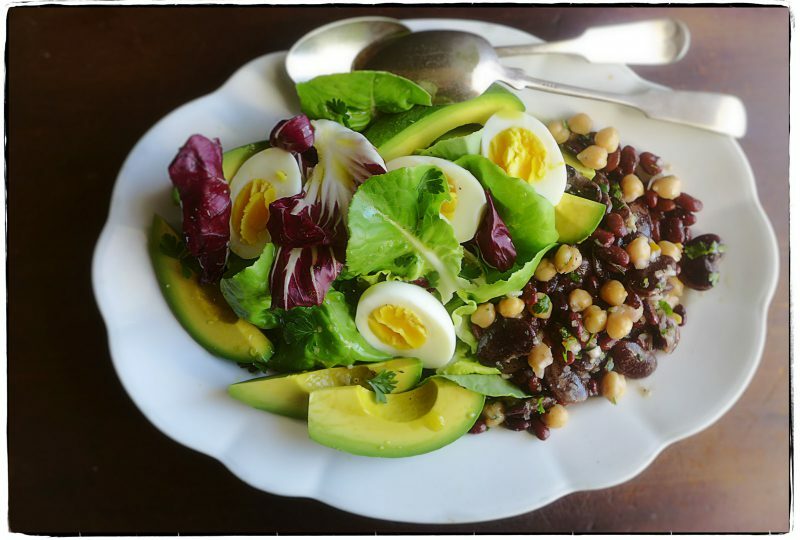 Served with slices of avocado, hard-boiled eggs, and radicchio and Bibb lettuce leaves that ubiquitous salad became a fine lunch. 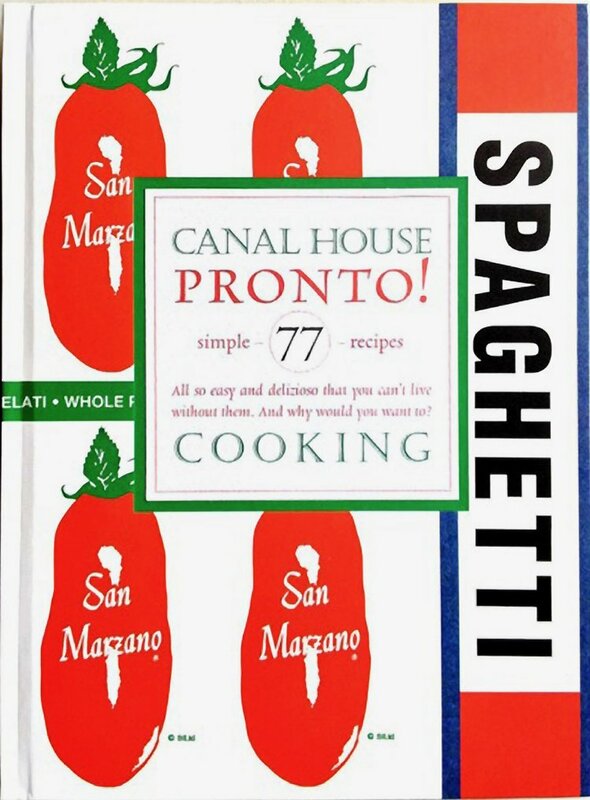 Stay warm and cook something delicious for yourself, dear friends. 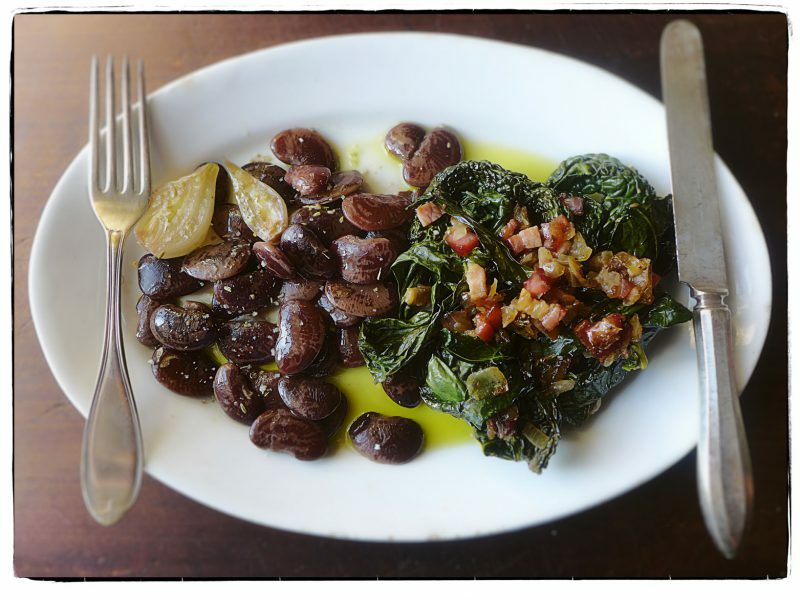 Lunch today is big mahogany-colored, chestnut-flavored Christmas limas and Tuscan kale cooked with bacon and onions. 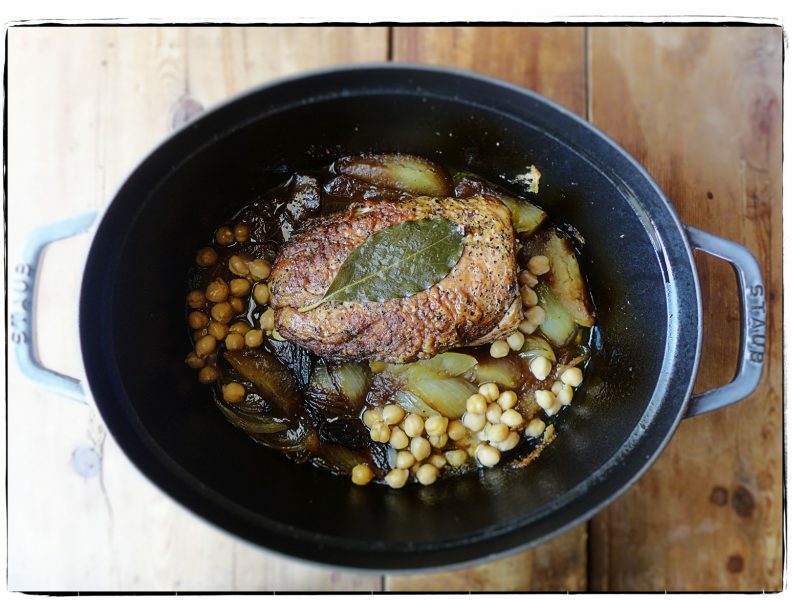 We seasoned our earthy dish with Lior Lev Sercarz’ spice blend, Cancale N° 11—fleur de sel, fennel, and orange peel. This flourish made it downright elegant. 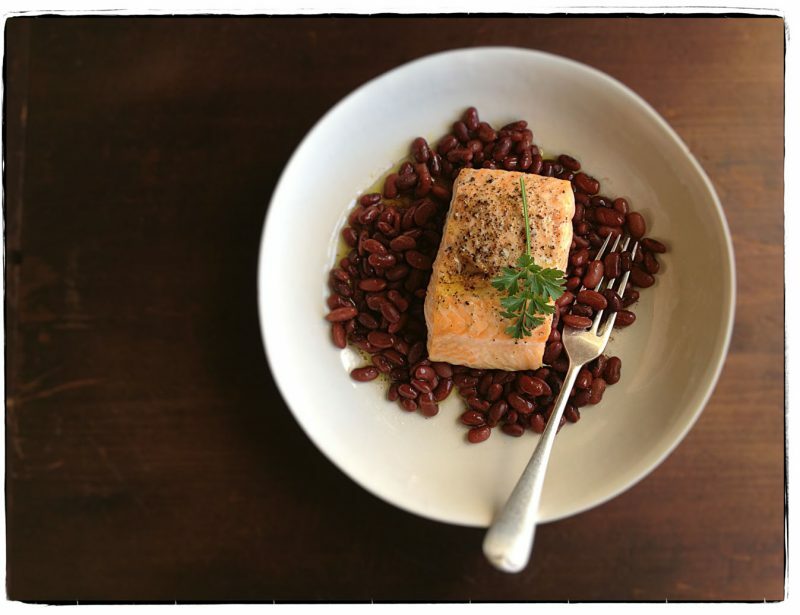 Today’s lunch—day three of a week of beans—is pan-roasted wild salmon and dense, meaty sangre de toro beans. To “spice” things up a bit, we added a fiery dried red chile to the earthy beans as they simmered and softened in the pot liquor. If this isn’t the ultimate surf n’ turf, then we don’t know what is. Looks like we are on a bean kick—yesterday, creamy cannellini and duck; today, nutty garbanzos with roasted apples, onions, and pork loin. We’re going to keep it going and cook a week of beans. Stay tuned. It is the dreariest day of the new season—bone cold and has been pouring all morning. 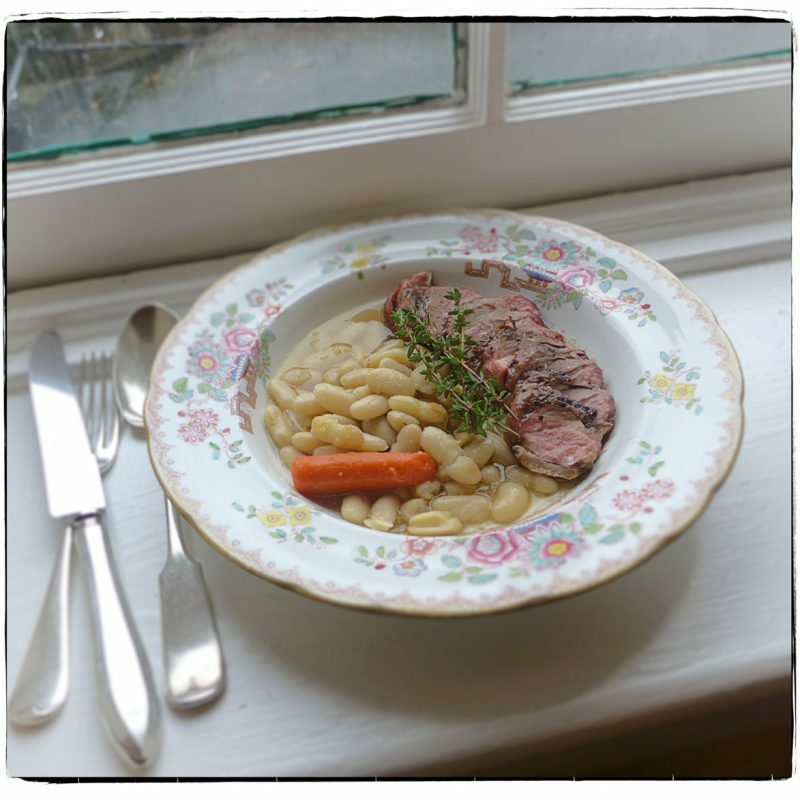 We’re lifting our spirits with a fire in the wood stove and filling our tummies with sliced duck breast and soft cannellini beans in a beautiful duck broth. This is our kind of comfort food. Let it rain! We’ve been on the road and are just now back in our studio. While we were gone, fall finally arrived with its brisk weather. (There was actually a dusting of snow in the woods by the river this morning.) We built a fire in the wood-burning stove—it made it so cozy in here. Inspired, we buried a few small deep-purple eggplant and a kabocha squash right in the red-hot embers and roasted them until they were tender and smoky. 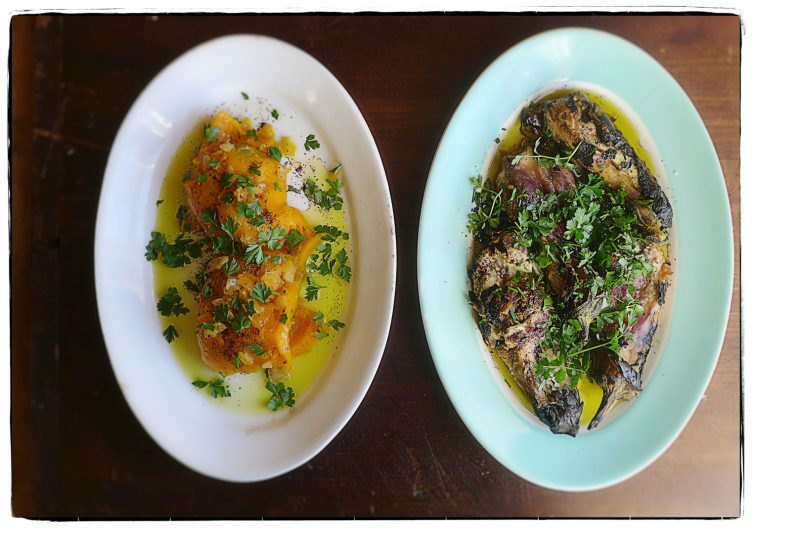 The eggplant were dressed with olive and walnut oils, lemon juice, s&p, sumac, and parsley. The squash flesh was seasoned similarly, with olive oil, diced preserved lemon, pepper, and parsley. Cook something delicious for yourself and have a lovely weekend, dear friends.